GENEVA, Switzerland (CNN) -- Confirmed cases of swine flu worldwide increased to 257 on Thursday, up significantly from the previous day's total of 147, the World Health Organization reported. 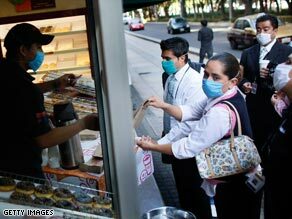 Mask-wearing people buy coffee and doughnuts Thursday morning in Mexico City, Mexico. In the United States, the Centers for Disease Control and Prevention said it confirmed 109 cases of swine flu, or 2009 H1N1, in 11 states, an increase of 18 from its previous total. The death toll climbed again Thursday, with Mexican officials announcing the number of confirmed deaths increased to 12. There has been one death in the United States attributed to swine flu. Officials in Mexico said they suspect more than 150 deaths there were caused by swine flu and are continuing to investigate. The biggest increase in confirmed infections occurred in Mexico, which has 97, WHO said. There were 26 confirmed cases Wednesday. Mexican officials announced an even higher total, with Health Minister Jose Angel Cordova Villalobos saying they confirmed 312 cases. That number, announced late Thursday night, was up 52 from the number of cases Mexico confirmed earlier in the day. The higher totals do not necessarily mean that incidence of the disease is increasing, but rather that health investigators are getting through their backlog of specimens, said Dr. Keiji Fukuda, assistant director-general of WHO. The latest tally was announced one day after WHO raised the pandemic threat level to 5 on a six-step scale. WHO did not change the threat level Thursday. The level 5 designation means infection from the outbreak that originated in Mexico has been jumping from person to person with relative ease. In addition to Mexico and the United States, WHO has confirmed non-lethal cases in Austria (1), Canada (19), Germany (3), Israel (2), Netherlands (1), New Zealand (3), Spain (13), Switzerland (1) and the United Kingdom (8). On Thursday, Japan reported its first suspected case, which has not been verified by WHO. In the United States, New York has the most confirmed cases, with 50, followed by Texas, with 26. California has 14 cases. In Washington state, a pediatrician who saw 22 patients and their parents Monday is among 13 people that public health authorities say have "probable" cases of swine flu. The pediatrician, who works at the Everett Clinic near Seattle, Washington, and who was not identified out of privacy concerns, may have exposed some of her patients to her illness, authorities said. The CDC on Thursday added an 11th state, South Carolina, with 10 cases. "There are many more states that have suspect cases, and we will be getting additional results over time," said Dr. Richard Besser, acting director of the Centers for Disease Control and Prevention in Atlanta, Georgia. The state health departments in Delaware, Colorado, Georgia, Nebraska and Virginia on Thursday said they had confirmed swine flu cases: four in Delaware, one in Georgia and two each in Colorado, Nebraska and Virginia. California state officials said they had two new confirmed cases Thursday and Florida's health department said it sent three samples it can't identify to the CDC. Their counts have not been added to the national total. By Monday, Besser said, all states will have additional antiviral drugs from the Strategic National Stockpile that can be given to people at high risk for flu. There hasn't been a decision on whether to attempt making a vaccine specifically for H1N1, he said. But the 2009 H1N1 virus is a hybrid of swine, avian and human strains, and no vaccine has been developed for it. The U.S. government has stockpiled 50 million courses of antiviral medication to treat swine flu, Department of Homeland Security Director Janet Napolitano said Thursday. The states have another 23 million and the Department of Defense has millions more, she said. Napolitano said some of those treatments, along with gloves, masks and other medical equipment, were being shipped to affected states on Thursday. "More [will] continue to get distributed every day until we're complete," she said. Nearly 300 U.S. schools with confirmed or possible H1N1 cases were closed Thursday, affecting about 169,000 students, the U.S. Department of Education reported. No colleges or universities were known to be closed, the agency said. Napolitano said parents of children whose schools closed should keep them at home instead of taking them out in public. "The entire purpose is to limit exposure," she said. "If a school is closed, the guidance is and the request is to keep your young ones home." One death from swine flu was confirmed in the United States this week. A toddler from Mexico died at a Houston, Texas, hospital Monday. In Mexico, where the first cases were detected, all schools have been closed. Mexican President Felipe Calderon took to television late Wednesday night, saying the country has enough medicine to cure the sick. "In times of difficulty, we've always come together," he said. "Together we will overcome this disease." Ecuador joined Cuba and Argentina in banning travel to or from Mexico. Egypt began slaughtering all pigs Thursday, although no cases of swine flu have been reported in that country. CNN's Karl Penhaul, Diana Magnay, Jake Perez, Saeed Ahmed, Umaro Djau and Nicole Saidi contributed to this report.